Flickering No-Flame LED Tea Lights! Turn them on or off as needed. They never melt down or smoke out. But the ambience is still the same! Use whenever children are present. These flickering no-flame LED tea lights last for about 60 hours! Turn them on or off as needed. They never melt down or smoke out, yet still create the same ambience of a wax candle. Perfect in luminaries or at events where children are present. Each measures 1-1/2"W x 1-1/4"H. Batteries included. Lantern not included. Tea lights add interest to lots of projects. 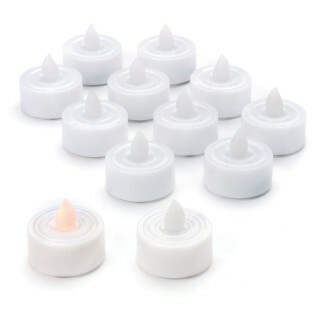 These tea lights are very useful for making simple crafts and holiday decorating. we use these on windy nights and they are perfect! I made paper lanterns and bought these to place inside the paper bag. Easy and safe for kids. Can be turned off when not in use.